In August of 1990 Iraq, under the rule of Saddam Hussein, invaded Kuwait. The international community responded with the formation of a coalition led by the United States. Countries immediately rushed military units to Saudi Arabia and other surrounding countries. The U.S. military called this phase of the war Operation Desert Shield. In the early part of 1991 the coalition armies invaded occupied Kuwait and pushed up into the southern part of Iraq. The ground war was halted after just 100 hours. The Iraq Army (the part not already destroyed) retreated northward towards Baghdad. The coalition armies, after a short period of time, moved south back into liberated Kuwait. The Desert Storm phase lasted only 43 days - from January 17 to February 28, 1991. The land campaign lasted just 100 hours. Why Did Saddam Hussein attack Kuwait? Iraq was saddled with a huge debt owed to Kuwait and the United Arab Emirates (UAE) - both countries had help finance his long war with Iran. Hussein demanded a cancellation of that debt but both countries refused. In addition, Hussein accused Kuwait of 'slant-drilling' across the border to steal Iraqi oil. He also accused both Kuwait and the UAE of over-producing oil which lowered oil prices thus hurting Iraq's economy. In August 1990 Iraq invaded Kuwait and occupied the country until pushed out by the U.S. and other Coalition nations. Airpower. 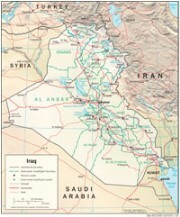 The push by ground forces into Kuwait and the southern most part of Iraq was preceded by a significant bombing campaign by the U.S. and Coaltion forces. Read more in Airpower in Desert Storm. U.S. Casualties. The U.S. casualties in the Persian Gulf War included 467 wounded and 148 battle deaths. An additional 235 died in theater of ailments or non-combat injuries. Shias and Kurds Revolt. In the aftermath of Desert Storm the Shia population in the south of Iraq and the Kurdish population in the north of Iraq revolted. Saddam Hussein crushed these revolts with his tanks and helicopter gunships creating a huge refugee problem along the Iranian and Turkish borders. After tremendous international pressure the United States and other countries provided humanitarian relief in Operation Provide Comfort. 25 Year Anniversary. A number of news reports and papers were wrote in January 2016 about the 25th anniversary of Desert Storm. All external sites open up in a new window.